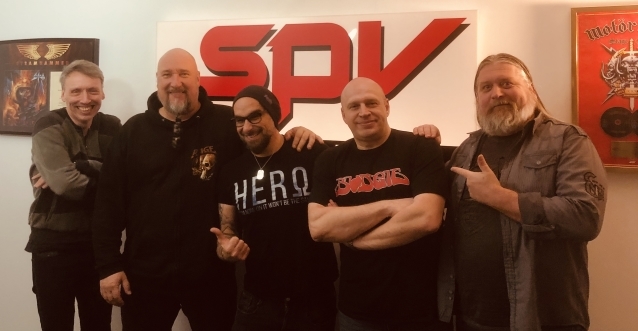 Share the post "RAGE Signs with SPV/STEAMHAMMER; 25th Studio Album Due In January"
15 years after the arrival of their live recording “From The Cradle To The Stage”, German metal veterans RAGE have returned to SPV/Steamhammer. The band — featuring frontman Peavy Wagner, guitarist Marcos Rodriguez and drummer Vassilios “Lucky” Maniatopoulos — is working on material for its upcoming album, “Wings Of Rage” (working title), scheduled for release on January 10, 2020. The disc’s first single will arrive in September, to be followed by the second single just before Christmas. RAGE is planning to embark on a festival tour across Europe this summer, performing the full “XIII” album with the LINGUA MORTIS ORCHESTRA live for the first time. The show had its baptism of fire at the 70000 Tons Of Metal cruise, and a special highlight will be RAGE‘s appearance at the Wacken Open Air at the beginning of August. Toward the end of the year, RAGE is scheduled to play several important winter festivals, before the “Wings Of Rage” tour kicks off in February 2020.